Free laptop with mobile broadband? Many mobile broadband packages now offer a laptop or netbook as part of a package deal. Compare amazing laptop offers from £25. Free laptop and broadband deals give you the chance to break free of wires and get online on the go. Because laptops are intended to be used on the move, bundling them with mobile broadband makes perfect sense. Why limit your broadband use to your home? 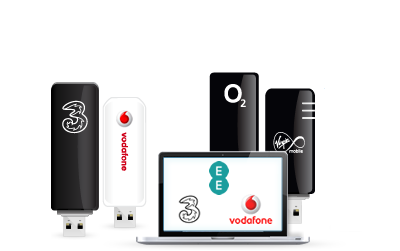 The packages offered by Three, Virgin Media, Vodafone, O2 and EE mean that you can connect to the internet at broadband speeds no matter where you are (subject to mobile phone network coverage). To find out the mobile broadband coverage in your area click onto the providers coverage checkers and enter your postcode. The free laptop deals above come with a free dongle that can be plugged straight into the USB slot of your laptop or have a 3G broadband SIM card embedded inside. Dongles are small and discreet and ready to go instantly. Alternatively you could opt for a broadband-embedded laptop which removes the need for a dongle altogether. We'll be explaining how these work below. Considering the amount that the laptops on offer are worth (upwards of £550) there are genuine savings to be made by combining your laptop with a home or mobile broadband purchase. These offers also make it incredibly easy and quick to get a new laptop without a big lump sum to pay. As most free laptop deals are on 18 to 24 month contracts, you are given the time you need to pay off the laptop deal without paying excessive charges in interest. Some mobile broadband providers have bypassed the trend of offering laptops with external USB modems by offering netbooks with built-in mobile broadband. This takes the hassle out of using your free laptop to connect to the internet. With nothing to plug in, your mobile broadband experience is more seamless than ever. Who are free laptops for? Getting a free laptop with your mobile broadband is very similar to getting a free phone with a mobile phone SIM card. Mobile broadband is especially suited to laptop users as it requires no external power source and can be used to get online anywhere there is mobile phone coverage. Mobile broadband free laptop deals are a great way to save money on both broadband and laptop purchasing, making them a winning combination for both customer and broadband provider. A free laptop deal is becoming the default way to get mobile broadband for many. Three - there are a number of free laptop deals on offer when it comes to Three. And we think they provide very generous usage limits, too. O2 - offers a range of free laptop deals, with great computers such as the award-winning computers. Vodafone - offers a number of free laptop deals at great price points. Virgin Media - Virgin Media laptop deals enable you to get a highly rated laptop and plenty of monthly usage. Are you thinking that it's about time to get a new laptop? Why not stop shelving the idea and choose one of the mobile or home broadband with free laptop packages above and kill two birds with one stone? In many ways, the rise of tablets, such as the iPad, has seen laptops become somewhat superseded by the newer technology. Tablets dispense with traditional keyboards for a touchscreen that recognises inputs you make with your fingers directly on to the display. Broadband and free iPad deals are now much, much more common than broadband and free laptop deals, reflecting the latter's fashionable status and a sea change in people's web browsing habits.